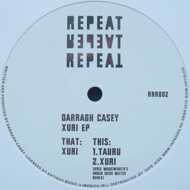 This time Repeat Repeat Repeat is bringing you a Darragh Casey release which was originally released in 2010 on the Irish Antiqua Recordings. Listening to the whole material one is soon wondering why this artist hasn’t released more music. Xuri EP features a nice mix of darker and lightsome sounds which is topped by a superb Kris Wadsworth remix. Darragh, it’s time to get back in the studio!